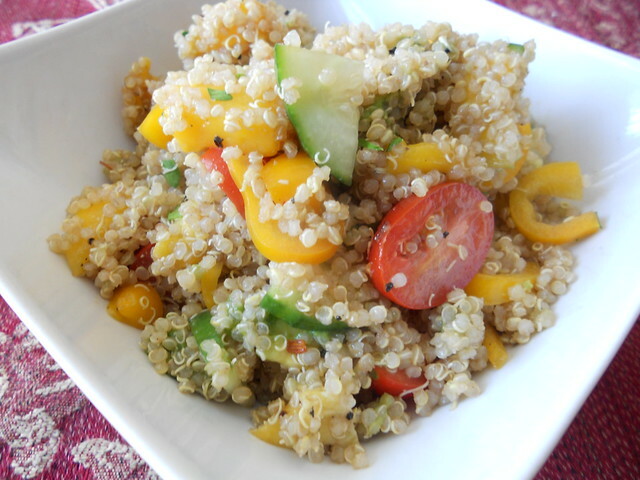 So Simple It’s Silly: Quinoa Salad.. nom nom nom!!! Like many.. MANY people who’ve recently discovered quinoa and how versatile it can be. I’ve filled my kitchen with various recipes of the “super food”. I whole heartily call it a super food because of all its nutritional value! High in protein, a good source of dietary fiber, phosphorus and is high in magnesium and iron. Quinoa is also a source of calcium, great for vegans and the lactose intolerant. Quinoa is gluten-free and considered easy to digest. it has a nutty flavor, incredibly easy to cook and works in just about everything. How can you not love it!? I’ve made many different quinoa salads and my Mom is completely on the bandwagon, she inhales this stuff like there’s no tomorrow, even uses it as a rice substitute! This is a simple salad where the only thing you have to cook is the quinoa, everything else is chop chop, dice dice and mix mix and finally nom nom nom!!! 1. Cook quinoa according to package direction and allow to cool until only slightly warm. 2. Add chopped tomatoes, cucumbers, scallions, peppers, parsley and mangoes to a salad bowl, toss with salt and pepper. 3. Whisk together Balsamic Vinegar, oil and shallots for a vinaigrette, set aside. 4. Add slightly warm quinoa to the vegetables followed by the vinaigrette. Toss to combine. Lastly add avocados and mix in gently. 1. You don’t want to mush up the overly ripped avocados, so add those last. 2. You can use your favorite vinaigrette as well. I also like a soy ginger vinaigrette with the combo of veggies and fruits. 3. Salad only taste better as it sits! Serve as a side dish to baked or grilled fish, chicken or pork. Easy to do for potlucks and gatherings. I just like how refreshing it is with all the bright crunchy veggies, hit of herbs and sweet succulent texture of mangoes and avocados. This is fast becoming one of my favorite salads to make and eat! Previous Post Healthy And Tasty Meatballs? Why Yes Sir!